Minnie Alice Keen, born October 1, 1920, was the daughter and eldest child of Morris Nickelson Keen and Lois Mae (Barger) Keen. She grew up in and around Springtown, TX. Her family used to farm and when she was a baby her mother would place her on a cotton sack and drag her along behind as she picked the cotton. Morris & Lois went on to have two more children, a sister & brother to Minnie Alice. They were Marcalea and Wayman Keen. Sometime after Minnie Alice got older, the family moved to the North Side of Fort Worth on Azle Avenue. Minnie Alice’s husband William Odis Clark, also a long time resident of North Parker County, was the son of William Alexander Clark and Annie Ethel (Mullinax) Clark. Little is known about how they met but on April 23, 1943 Minnie Alice and Odis snuck off and got married without telling anyone. Well when Minnie Alice finally told her mother she got really upset and Lois asked her why it was such a secret. Minnie Alice told her that it wasn’t a secret “the marriage license is in the top draw of my dresser where anyone can see it”. However, the marriage certificate was rolled up in brown paper and hidden in the back of the drawer. Lois’ first thoughts were that Minnie Alice might be pregnant. So she told Odis that if him and Minnie Alice are married then they weren’t to spend another night apart. 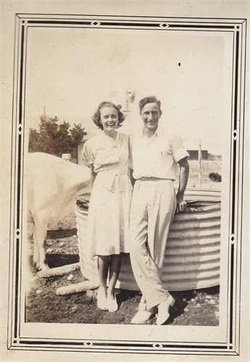 Lois had Odis move in with them were she always treated him like her son and did so until her death in 1992. Of course now we know that Minnie Alice was not pregnant at the time of her marriage. Eventually Odis and Minnie Alice bought a home of their own just a block away from her mother and father on the north side of Fort Worth (2500 NW 27th street). 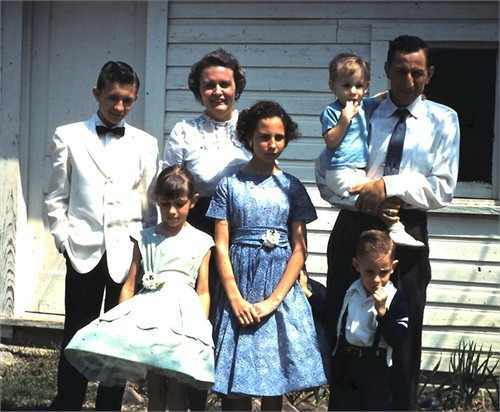 They went on to have 5 children: Larry Wayne, Glenda Dianne, Judy Marlene, Gerald Ray, and William “Billy” Morris and they were all long time members of Rosen Heights Baptist Church. Odis supported his family by working at General Dynamics as a warehouse clerk. Minnie Alice stayed home and raised the kids. She was the kind of Mom that cooked, joined the PTA, made costumes for all the school plays, hand painted all the Easter eggs, and spent hours decorating the Christmas tree so it would be perfect. In fact, she made sure that the holidays were special. It was a tradition that all the kids had new pajamas to wear on Christmas Eve. And every Christmas Eve she was usually frantic trying to get everything ready for the kids on Christmas morning. She would often stay up all night doing some last minute sewing on handmade doll clothes or some other handcrafted holiday gift. A lot of the time Minnie Alice would start running out of money so her sister, Marcalea, who was an employee of Montgomery Wards, would take her to the bargain basement on Christmas Eve for some last minute deals. And on Christmas morning family would gather for Minnie Alice’s breakfast that was nothing short of a feast. Minnie Alice had a set of red Depression glass dishes that she would serve meals on during the holidays. Minnie Alice was also very talented when it came to sewing. She would often take her girls window-shopping for clothes. And when she got back home she would reproduce the dresses she had seen. The kids were always fashionable dressed. And if this wasn’t enough, Minnie Alice also taught tole painting classes. Much of her artwork has been passed down to her kids and grandkids. Family was very important to Minnie Alice and so she also did a lot of work on the family tree (mostly late 1950’s early 1960’s). She would write letters to extended family and many would write her back and include pictures. Her daughter Judy told me that Minnie Alice planned the family vacations around her genealogy research. Judy said that she remembers being on vacation as a kid and having to make stops at “old peoples” houses so Minnie Alice could talk to them. But if not for the hard work of Minnie Alice then the family wouldn’t have many of the old family photos that exist today. Future generations shall be indebted to her forever. At some point, Minnie Alice and Odis owned an antique store, “Clark’s Country Cousins”. It was in a converted house about a block away from their home. Odis worked so it was really Minnie Alice’s job to run the store. She would often go out “junking”, as she called it, to flea markets, garage sales, other antique stores, etc. Minnie Alice’s sister, Marcalea, once told me that Minnie Alice could just pick up a piece of depression glass and tell you if it was real or not. She could tell by the way it felt. I’m not sure when Minnie Alice purchased the antique store but I was told that they had to sell it when she became sick (breast cancer). Mary Keen, Minnie Alice’s sister in law, told me that it had just really started to make good profits when they had to sell, so I assume they must not of had it for too many years. Anyway, after Minnie Alice’s death a lot of the antiques from the store ended up being stored in Odis’ garage/house and Minnie Alice’s sister’s house (Marcalea Keen)…along with her genealogy research. Throughout the years it all got “divided out” so that’s one of the reasons why a lot of Minnie Alice’s genealogy research isn’t located with any one family member. Besides being very artistic and crafty, Minnie Alice was a real people person. She was calm and had a laid back personality with a dry sense of humor. She was a good fit with Odis. When Minnie Alice died in 1969 she was originally buried in Springtown Cemetery near her father. She did not like the idea of being buried at Clark Cemetery. She thought it was too dreary and abandoned. 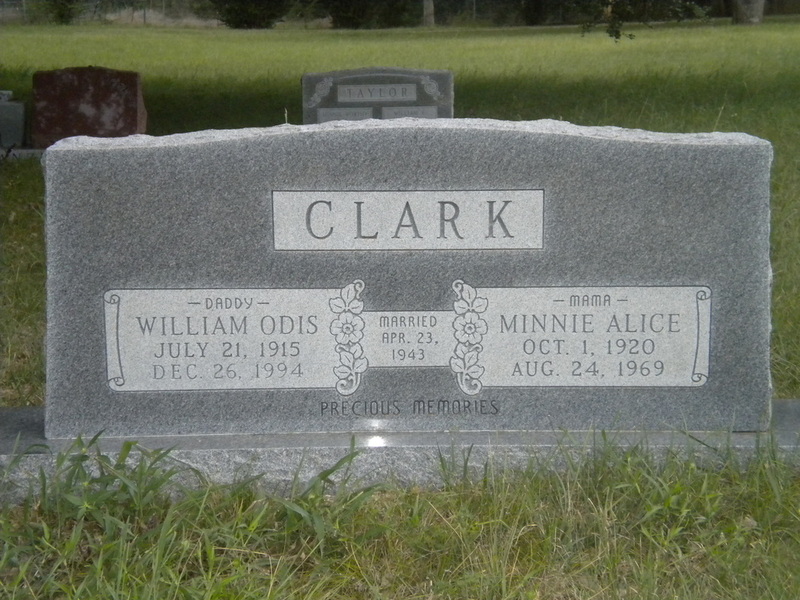 But at the time of Odis' death in 1998 her children had her moved to Clark Cemetery to be with him. They felt that she would approve because the cemetery was now better kept and not so dreary anymore.